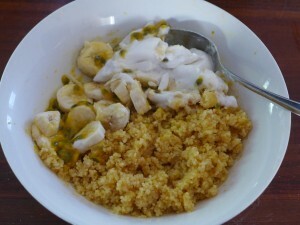 I first had couscous for breakfast at Arcadia in Fitzroy about ten years ago. I loved it then and went home to create my own version which I have been eating ever since. I still love it because it is quick and easy to prepare as well as comforting and delicious. I cook mine with a mixture of orange juice, water, cinnamon and either maple syrup or a bit of sugar and serve it with fruit, nuts and coconut yoghurt. The fruits can vary with the season and be fresh or cooked. At the moment my garden is producing passionfruit by the ton so I’m eating those. You can cook the couscous in a microwave by throwing everything into a serving bowl and nuking for 2 minutes. I cook mine this way because it saves on washing up. If you don't have a microwave then heat all the ingredients in a saucepan except the couscous. When the liquid comes to a simmer, add the couscous, replace the lid and turn off the heat and leave for 5 minutes. Whichever way you cook it, fluff with a fork and serve with fruit and yoghurt.